' Queso' is cheese in spanish. 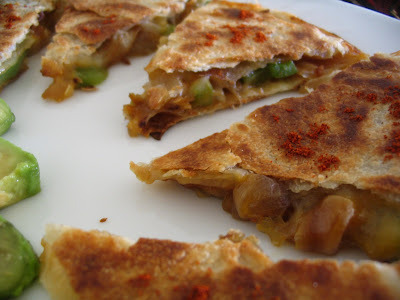 Quesadilla is toasted tortilla with melted cheese inside. With cheese we can put any kind of stuffing inside. Here I have put Bell peppers, onion and mushroom. Stuffing can be made according to our choice and combination. And regarding cheese again its our choice. We love sharp cheddar and mozzeralla so I have added both. It is served with sour cream, salsa and guacamole. Since I made 3 types of salsa I am posting it with store bought tortilla chips. Enjoy this mexican platter !!!!!!!!!! 1. Heat oil in the frying pan and add onion saute until light brown then to that add the mushroom. 2. When all the water oozes out and dried add bell pepper salt, garlic powder and pepper. 3. Saute until they are lightly browned. 4. Now heat olive oil in the pan put all the tortilla one by one and make it warm and keep it aside. 5. Now again put one tortilla in pan and add the topping mixture and cheese. 6. And cover it with other tortilla. The cheese melts and they will stick to each other. 7. Using spatula lift up with one side of quesadilla and flip over other side very carefully. 8. Do this every 3 minutes in low flame until they are browned and crispy on both sides or quesadilla. 9. Once it is done remove from pan before it is cooled cut them using pizza cutter and serve hot sprinkling with paprika and cumin powder. 10. 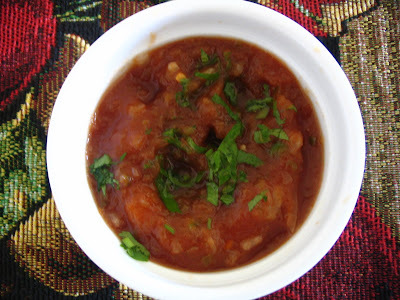 Enjoy with salsa, sour cream and guacamole. 11. Now get ready to make another quesadilla with remaining wraps and stuffing. 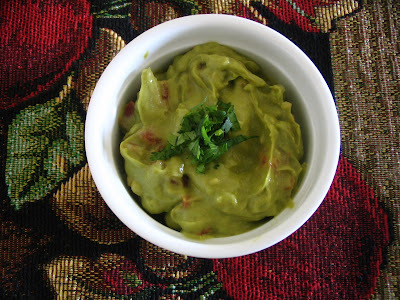 Guacamole, a dip made from avocados. To get the perfect guacamole use ripe avocados. The color of avocado should be dark and give it a gentle press outside of avacado if it is bit soft then right to make. 1. De seed the avocado and put in the bowl. Mash it with fork. 2. Then add all other ingredients and mix well. 3. Everything has to be blended well. Refrigerate until used so that it enhances the flavour. 4. Serve with chips or quesadilla or in Burrito. 1. Mix all ingredients and refrigerate to enhance flavors. serve with chips. Put everything in the blender and run it until everything is well blended. But they should not be so fine has to chunky enough. Add some cilantro for garnishing. 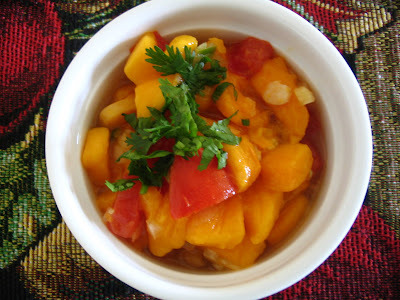 So yummy and serve with tortilla, quesadilla, Burritos. Regarding chillies each of them will give different taste and if you do not have those particular chilli in your fridge use jalapeno for everything and adjust it according to your spice levels. Look at the feast....Lovely..I am inviting myself there lol.. 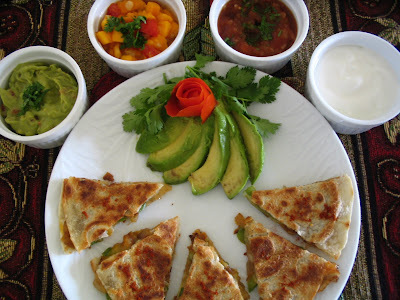 Wonderful Quesadilla and salsa recipes. You have a very nice and clean space and I love your food decorations.Thank you for visiting my blog. this is an excellent post! you did a beautiful job! C i go spanish seeing the dish!!! 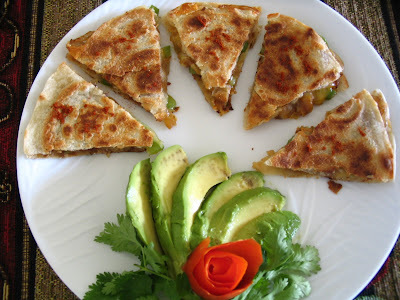 Wondeful quesadillas...just drooling here! 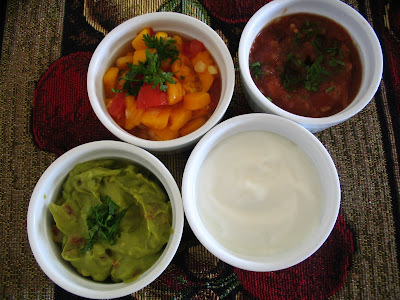 wat a lovely collections of salsas, mouthwatering! LOve them all ...i dont have words to say..i am drooling :)! wow this is such a good mexican spread! Kooookoooo! Oh wow!!! What a lovely mexican meal... The pics look great! Will soon be posting my version too! 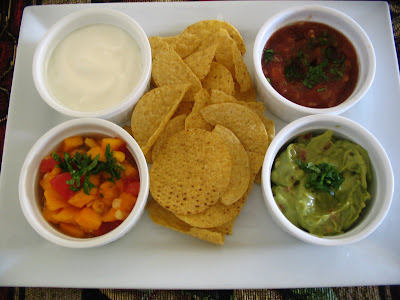 Felt like coming back to this post:) U have done a great job dear.. Guac, mango salsa, salsa everything is superb!!! Such a wholesome meal! EXCELLENT!! Hey, wonderful.. tempting mexican feast for eyes !! Looks so gud an colorful !! A real feast with a variety of salsas. Love mexican food. 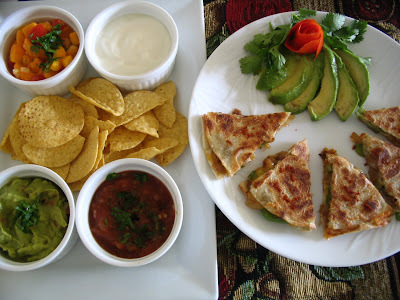 I am hungry again though I just had heavy dinner... Fabulous stuff..
Mexican food is my fav..Quesadilla looks Yummy dear..You really have a lot of patience to cook all three sides at the same time..
Wow kalakareenga Anni.. awesome.. its extremely mouth watering :)wish you were here. I would have tasted all ur dishes..
What a fabulous feast! Quesadillas are delightful and love all of the salsas! Love the quesadillas. Din't know that meant cheese. Thanks everyone for ur lovely words. That is quite a spread, everything looks delicious! wowo wow wow, I love all of them, what a colorful platter, may I join the feast?